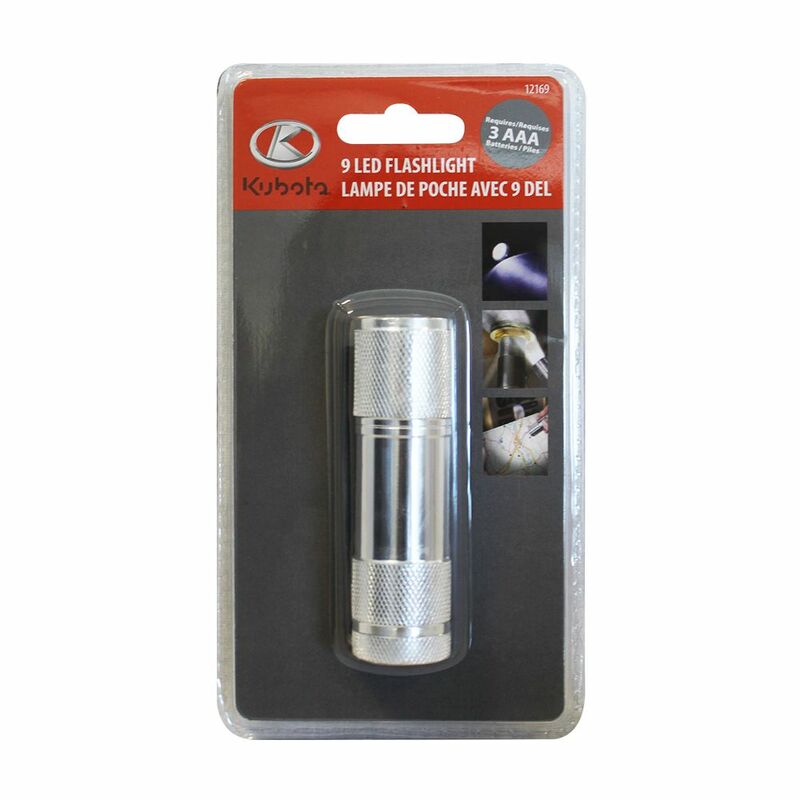 This Kubota 9 LED Flashlight is perfect for camping, auto emergencies and home repairs. Features diamond knurl design for grip and constructed of lightweight aluminum. Powered by 3 x AAA batteries (required). One of the few silver aluminum lights in the line, the G45 Flashlight combines our Utility Beam optics with a fairly compact size that is great for a wide variety of situations. It produces a wide diffused flood that is optimal for shorter distances. With Coasts commitment to quality, the G45 Flashlight is impact resistant, weather resistant and its LEDs are virtually unbreakable. The G45 Flashlight is backed by Coasts lifetime warranty against defects in materials and workmanship. Tested and rated to ANSI/FL1 standards. The HP450 Flashlight uses Coast's Pure Beam Focusing Optic System with Slide Focus to harness the light and create a superior beam quality from spot to flood. The Bulls Eye spot beam pattern gives you a great focused spot while producing an outer ring of flood light which allows you to see a broader area to the sides. The flood beam is broad and consistent, giving you a clear field of vision not seen with typical focusing flashlights. A quick-cycle switch allows you to select between a high output setting to a low output setting with ease. Built tough, an impact-resistant, lightweight aluminum casing resists rust and corrosion. The HP450 also features an unbreakable LED and rubberized O-ring for reliable water resistance and durability. With Coast's commitment to quality, the HP450 Flashlight is impact resistant, weather resistant and its LED is virtually unbreakable. The HP450 Flashlight is backed by Coast's lifetime warranty against defects in materials and workmanship. Tested and rated to ANSI/FL1 standards. 9 LED Flashlight This Kubota 9 LED Flashlight is perfect for camping, auto emergencies and home repairs. Features diamond knurl design for grip and constructed of lightweight aluminum. Powered by 3 x AAA batteries (required).